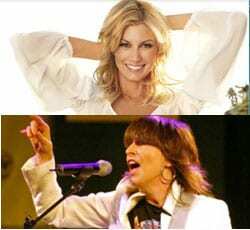 A special episode of CMT Crossroads will pair Faith Hill with The Pretenders, live from the Super Bowl festivities. The show will premiere on CMT Saturday, February 5 at 9 p.m. CT. It is part of the NFL Pepsi Super Bowl Jan Fam, a three-show concert series being held at the Verizon Theatre in Grand Prairie, TX. Fronted by Chrissie Hynde, The Pretenders were inducted into the Rock and Roll Hall of Fame in 2005. This will mark the CMT Crossroads debut for both artists. Hill has strong ties to the NFL as the voice of NBC’s Sunday Night Football.